Load mp3, set one ore more Hotcues to the track. 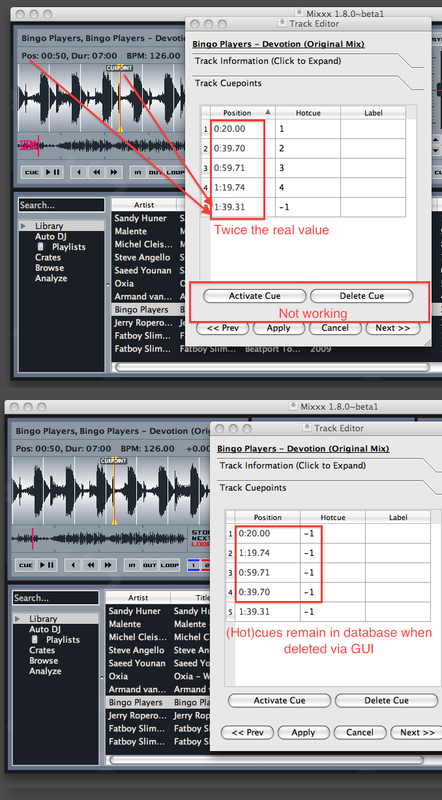 Close and reopen Mixxx, select same track and open Trackeditor via right-click. *When editing or adding Hotcue via Trackeditor Mixxx`crash. This should be fixed now. Verified fine for me on the Deere skin -- hotcues in the overview line up with their actual position now and the track information dialog shows them properly and doesn't crash when you click apply. Nice,the crash is gone :-) But there may some minor errors left. *Position for (Hot)cues is shown twice the actual value. A (Hot)cue set at 0:10.00 shows up as 0:20.00. *You can not delete or activate (Hot)Cues via the the corresponding buttons in track information dialog. *If a (Hot)cue is deleted via GUI, the position remains in the database. Only the (Hot)cue number is set to -1. I just fixed the doubled-position issue and the delete button. I don't think that activate will work for this release because it's ambiguous which deck the person means for it to play on. (the same track could be loaded in both decks). I'll probably remove it. Not sure if you noticed, but in trunk no changes to tracks or cues save. I revived the features-sqlite branch to fix this problem mixxx-wide. When you delete a hotcue via hotcue_xxx_clear, it just resets the cue's hotcue to -1. 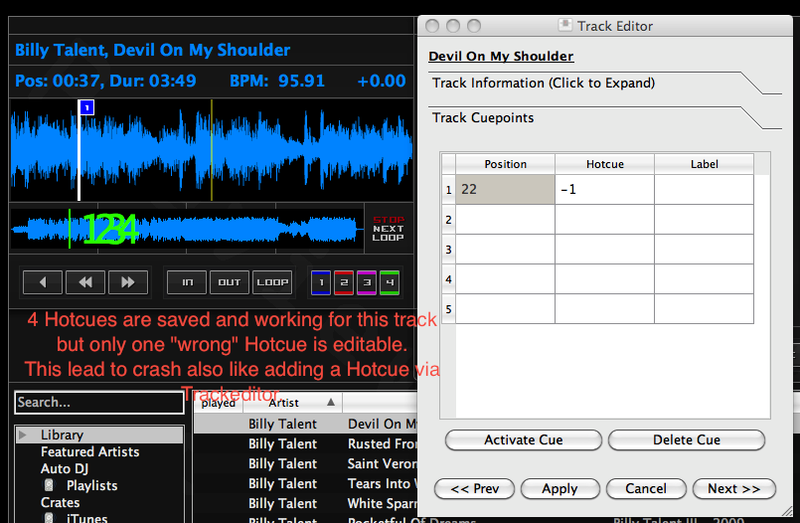 This is intentional so that if you spent time setting up your tracks hotcue's (adding labels, etc), then accidentally right-clicking a hotcue button will never actually delete it. The track info dialog shouldn't show the -1 though, it should just show it as blank.